What did you think of DAREDEVIL #607? DAREDEVIL #607 by Soule and Noto ships August 22nd and here is a preview! Please use this thread for all discussion on the issue when it ships next week! I love the recap at the beginning explaining the deal with Mike Murdock. What makes it work is that it's acknowledging the craziness but not shying away. The story is as it was told. Plus, it's fun to see Phil Noto drawing classic DD scenes. The prediction was as expected. I mean, I figured it was either Reader read Mike or Reader read Daredevil and Matt was going as Mike for some reason. But despite the camp fun, there's something else underneath. Is Mike Murdock alive? It would certainly be surprising since he not only was never alive but also died. But he has a heart beat and is capable of thinking and feeling. Plus, have we ever gotten to see Foggy react to the fact that Mike was fake? This is a good opportunity to explore that. I also enjoyed the acknowledgement of the Lee/Colan era's craziness. Noto used a different style for the Silver Age recap, which contrasted nicely once we showed up at the villain bar. My big problem with this issue is this: Why would Matt include references to Mike Murdock in his legal briefings about Wilson Fisk? The only time I saw him use the Mike alias since "killing him off" in the sixties was just one time in Mark Waid's run, and he didn't act anything like "Matt's twin brother." So, if the Reader made that version of Mike real, why would he be Matt's twin brother? The Reader can't know much about Mike Murdock. I don't know much about the current bass player in Maroon 5. If I had the Reader's power, and I fell asleep reading the liner notes of the latest Maroon 5 album, wouldn't the result just be a generic bass player who looks like the one in Maroon 5? Why would this guy have a fully-formed personality? Wouldn't this person represent only what the Reader knows about them, and in Mike's case that would be not much? Another problem is that I can't get a handle on who Mike is. In the previous issue, as well as the beginning of this one, Mike seems like a nice enough guy, but when he hears the Reader talk about unwriting him, he completely flips. I can understand a certain level of self-preservation, but why pull a gun on Foggy? What motivated him to do that? I suppose we need a cliffhanger, but I can't figure out where this character is going. Otherwise, Noto continues to be amazing, and I liked the bar fight. I thought Daredevil's takedown of Speed Demon was a nice showcase of his radar. I wish I had seen what White Rabbit could do, but that's okay. One last thing: the Reader had to know, going into this gig, that legal briefs aren't exciting. The complaint about them being boring made him seem ill-suited to this job, and I do want Daredevil and McGee's plan to go well. I refuse to believe that one lawyer's legal briefings are less boring than another. They're written in legalese -- they can't be entertaining. I gave this issue a three. I hope this Mike thing makes more sense to me in the next issue. I will say, Mike's appearance probably isn't worth over-thinking. To my knowledge, Reader only created one other living creature. In that case, he was provided an entire biography of a person, including witness accounts from every person they could find with memories of her. Even then, the person was missing so much that she was in an emotionally vulnerable state and the verge of a breakdown - particularly since those witness accounts weren't 100% consistent. Maybe it gets easier the second time through, but it's not worth trying to rationalize a story about Matt's fake twin brother too much. 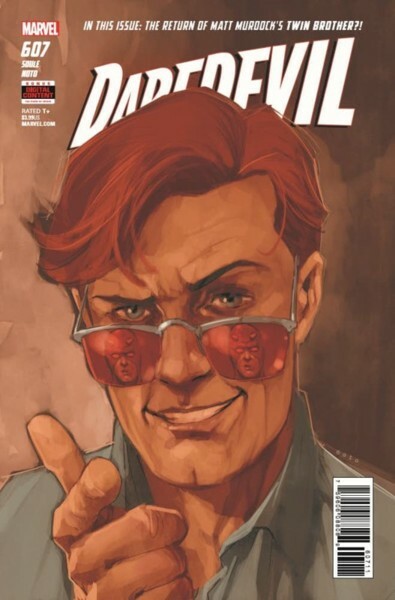 As much as I've been underwhelmed as a whole by this run, along with my disdain for revisiting anything regarding Mike Murdock, I have to say I enjoyed this book and I laughed at many parts. I think it's pointless to worry too much about continuity in Marvel comics. These days writers just come along and do as they please. I knew in order to enjoy this story I'd have to suspend my beliefs even more than I normally do when reading comics since Mike Murdock comes from an era that is far less realistic than this one. I did that and I had fun with the story. I do think Noto's amazing art really covers up for the silly plot. I hope Soule steps his game up because Noto is one of the best to ever grace a Daredevil comic. His work is a thing of beauty. Fun issue, though a bit predictable in how things progressed. I really like how Soule approached the history of Mike Murdock. Not sure how he could have done it much better given that it was something that needed to be told given that there is a good chance some readers have not idea about Mike Murdock. And without a doubt, Noto is my favorite artist that Soule has had. It is so good. And to Mike's point, loved that he had the opportunity to draw some of the classic DD stuff. The bar fight was pretty fun too. I too liked Matt taking on a speedster. I would give this one 4 stars on the strength of the art and I laughed a good bit reading this one which is not always the case with a Daredevil book. 4 stars as Noto is fantastic. Although I’ve liked all the artists during Soule’s run, Noto is one of my favorites. Just stunning work, and I’m impressed he’s adjusted his style so seamlessly to the title. I also liked Soule’s use of different villains here; it was great to see a speedster like Speed Demon fighting Daredevil. Finally, I really like Mike. I don’t see how he gets out of the next issue, unfortunately, but I’ll enjoy him while he’s here. He’s not all bad; he didn’t hurt Forey. He’s just desperate, and I don’t blame him for not wanting to be erased. That said, I have to agree with Dimetre here about the problems with this story. He’s totally right with his Maroon 5 bass player analogy. Mike is just too well constructed from a brief mention in a file (which doesn't make any sense for Matt to include anyway), especially considering Reader doesn’t know Matt is Daredevil. And, no, the speculation that Reader might be better at making people the second time around isn’t enough justification for me. Nor is saying the book was campy in the 60s, so why bother to have it make sense now. Soule’s the one who opened this box, so it’s his job to deal with the consequences appropriately. Unless Soule adds to his clarification of what happened in the next issue, I do think that’s a clear problem with this arc. I’m more than willing to go with the flow, but I don’t think it’s unreasonable of me as a reader to want an explanation that holds water. I can understand a certain level of self-preservation, but why pull a gun on Foggy? What motivated him to do that? I suppose we need a cliffhanger, but I can't figure out where this character is going. I think a more representative sequence of events would have been for Mike to say he’s Mike, not Matt, Foggy reply that Mike isn’t real, and then have Mike pull the gun in response, but that would have taken more panels and not have been nearly as dramatic a hook for the next issue. I wish I had seen what White Rabbit could do, but that's okay. Apparently running away when things get tough is her thing, so we did, LOL. That was funny, but I also agree with you here as well. Perhaps Matt shouldn’t have delegated the team composition to Frank. FWIW, I wasn't being serious when I said creating a person is easier the second time. There's also some implication that his dog has died before and he might have recreated him. BTW, sadly White Rabbit has apparently died in the new Jessica Jones comic.